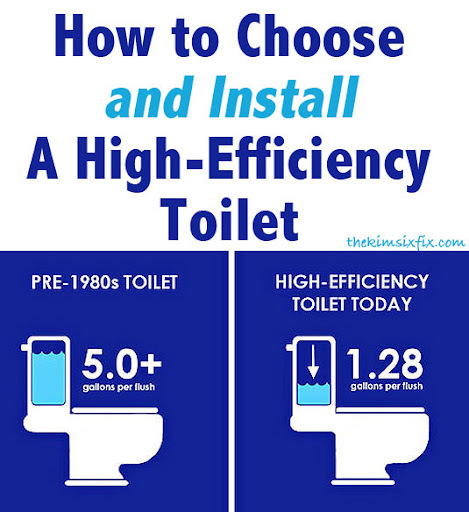 If you are using toilets installed anytime in the last century (okay.. it sounds crazy when I say it that way.. but I mean “Pre-2000”) it is pretty likely that you are either using way more water than you have to, or are using outdated technology which conserves water but is not very efficient at flushing waste or frequently clogs. You can see how large the tank was in order to hold all the water. You also will notice the tank is tapered, to give you more flushing power with less water. 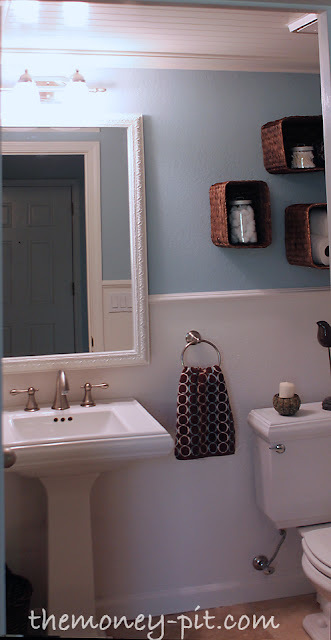 Plus it takes up less space in your bathroom, which is never a bad thing right? So how did I decide exactly which one was the best choice for me? When figuring out what kind of toilet you want to upgrade to, there are lots of things to keep in mind. 1. Flushing Power: This is a big reason a lot of people haven’t upgraded. They believe the toilets with less water just won’t work as well. And it was true that the 90s versions of “low flow” toilets actually didn’t FLOW very well at all.. often requiring multiple flushes. But changes in toilet design have helped alleviate that problem and now you can even find pressure assisted toilets which use a pump system and not just gravity to aid in the flushing process. Modification of tank shape, and changes to the shape and size of the outflow drain also make modern toilets much more powerful with much less water. When purchasing a new toilet many buying sites offer ratings on the ‘flushing power’ of different models so you can compare apples to apples. Another recent change to the way toilets function is the development of dual-flush technology. This is a mechanism by which you flush one way for liquid waste and another way for solid, since flushing solid waste usually requires more power. You can find new toilets with this technology integrated into it, or there are even retrofit kits to modify your existing toilets to use dual flush. This is an aesthetic and functional decision. Most residential toilets are two pieces: A tank and base with a bowl. But single piece toilets are available and tend to be easier to clean and have a sleeker look. They tend to be more expensive, but they function very similarly to a standard two piece toilet. This too is an aesthetic and functional preference. Elongated bowls tend to be more comfortable and are less prone to “misses” but they do require more floor space. Round bowls are good for smaller bathrooms. You need to consider your bowl shape when buying replacement seats and lids. These are a few factors that may be non-negotiable when it comes to selecting a replacement toilet. Because my old toilet was installed beneath a countertop I needed to the tank height to be a certain number of lower. That really limited my selection. Another important measurement is the bowl height. This determines how far down you have “squat” to sit on the toilet itself. Standard toilets have heights between 14 and 15 inches, while ADA and handicapped accessible toilets (known as “chair” or “comfort” height) have to be a minimum of 16.5 inches tall. There aren’t code requirements in residential restrooms, but most commercial spaces must had ADA compliant toilet heights. The other measurement you MUST KNOW when you select your toilet is the rough-in distance. That is how far your drain and mounting bolts is from the wall. Most toilets have a standard rough in distance of 12 inches, but in some smaller bathrooms, it can be closer to 10. There are even some models that require 14 inches of clearance. You can always install a new toilet with a smaller rough in distance (it will just float farther away from the wall) but you can’t go the other way. If your toilet requires only 10 inches of clearance, you can’t install a 12-inch rough in toilet. In my case, my replacement toilet was a 10 inch rough in (that was the only one they had with my height requirements) but my bolts were 12 inches from the wall. There is now a slightly larger gap between the toilet tank and the wall, but it isn’t a big deal. This is the final decision you need to make once you have figured out everything else on this list. Unlike everything else I mentioned, this is SOLELY personal taste. Toilets come in all sorts of shapes and colors. They also come in a variety of brands and price points. Obviously standard toilets are white but depending on your other bathroom fixtures, ivory, cream, or even black may be a more appropriate fit. So how hard is it to replace a toilet? Not hard at all. It is probably a two person job since the porcelain is pretty heavy, but you don’t need to be a master plumber or anything. Before following this tutorial, please check with your local building codes. In the state of California, toilets in single family homes built before 1994 can only be replaced with low flow versions and often require a permit and inspection. You can see my old toilet tank was held on by three bolts. With the tank out of the way this is the perfect time to paint behind it. I never could fit even a small brush behind the tank, so you can see how the wall was never painted. You will be left with the old wax ring (which seals the toilet drain to the floor drain and keeps sewer gas and water from leaking out), the flange (which is attached to the floor and holds the toilet in place with two large attachment bolts) and possibly a wax ring insert or “funnel” (which redirects the waste to the drain line.) You want to get rid of as much of the old wax as possible. It is also possible that your wax ring and funnel will either fully or partially pull away with the toilet. In that case you may see more of the flange. My toilet flange was orange, but typically they are white. Here is what one looks like when it is new. You want to get as much wax off as possible, but you don’t have to get them perfectly clean if you are immediately re-installing a toilet. You also can reuse the bolts if they are in good shape and not bent or rusty. Our toilet was actually re-installed after the floor was tiled less than 3 years ago so mine were pristine.. that is also why my old wax ring didn’t look too bad. If your toilet has been in place more than 5 years I would suggest using new bolts. Your new toilet will come with new ones so it is not a huge deal to replace them, but I just lucked out. Finally, don’t forget to scrape up any old caulk if there is any. All toilet bases don’t actually have the same footprint so you may not cover up the old caulk lines with the new toilet base. **See the end of this post for more information about caulking around the the toilet. Now to prep the toilet for installation. Wax rings come either plain or with the funnel already embedded in them. If you drain flange is AT OR BELOW floor level you MUST use a ring with a funnel. If your flange is ABOVE the level of the finished floor you can use a plain wax ring since the toilet drain and the floor drain will come into contact with each other. In my case, because the area around the flange was not tiled, but the finished floor was, I needed to use a funnel. Luckily almost all toilets you buy at big home improvement stores include a wax ring with funnel in the box along with the toilet, but you want to double check you have the correct kind before leaving the store. if you aren’t sure of the type, you can always pick one up.. they cost a whopping 89 cents: Cheaper than a return trip! Set the toilet into place over the bolts (this is probably a two man job. One to lift the weight and one to help align the holes over the bolts.) Remember ONCE YOU SET IT DOWN YOU SHOULD NOT MOVE IT!! You can break the wax ring seal if you move the toilet base.. so take the time to get it where you want it the first time! Once you have it in place, press it down pretty hard with a slight rocking motion to embed it into the wax properly. You should be able to get the toilet to rest on the finished floor, it shouldn’t be floating above it by resting on the wax ring. Finally put the tank lid back on, and attach the seat (following manufacture instructions.. all seats are slightly different). Turn the water back on, let it fill and flush it a few times..watching carefully for any leaks either between the tank and the base, from the waterlines, or from under the toilet itself. Ain’t she purdy? And I’m saving 50% more water with every flush! **There is a long-standing debate about whether or not toilet bases should be caulked. In many states it is a code requirement that commercial toilets be caulked for sanitary reasons (Bad Aim!) However, most plumbers only caulk around the front three sides so if there is a leak you can detect it (vs. sealing the water in under the toilet and causing the floor to rot.) If your floors aren’t level and you are worried about your toilet rocking, caulking is a good way to secure the base. You also can use a rope of plumbers putty under the edge of the base if you don’t want visible caulk lines.